ELS can perform both general and detailed botanical surveys. ELS integrates our botanical experiences with our other fields of expertise to assist in the best possible mitigation implementation and management of non-native, invasive plant species. ELS’ staff can assist clients to enhance their personal environment by landscaping their property or community park. 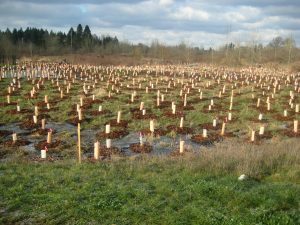 Our biologists can work with the client to choose native plantings and habitat features based on their personal preferences and our field crew can assist in the installation of the plan. ELS’ staff works routinely with landowners to assist in maintaining their current facilities with methods that are regulatory compliant. ELS understands the critical importance of maintaining properties to avoid unforeseen environmental permitting consequences due to neglect or abandonment. Site maintenance services also include removing invasive species, preparing mitigation sites, and installing mitigation plantings.